Srila Prabhupada in New York's Tompkins Square Park, Summer 1966. The East Village Other said that "he had suceeded in convincing the world's toughest audience that he knew the way to God." When His Divine Grace A. C. Bhaktivedanta Swami Prabhupada first arrived in America in the midst ol the cultural turmoil of the sixties, he quickly captured the hearts and minds of the New York hippies and the San Francisco flower children with the chanting of the Hare Krsna mantra. Within three years, he journeyed to London, and by 1971, Hare Krsna had been recorded on hit records by former Beatles John Lennon and George Harrison. By then the mantra had been heard by hundreds of millions of people, and the International Society for Krishna Consciousness, formed in New York in 1966, had spread to six continents. How could an elderly Indian swami in a strange, foreign land, with no money, no support, no friends, and no followers, achieve such phenomenal success? The story that follows includes eyewitness accounts and excerpts from Srila Prabhupada-lilamåta, the authorized biography of this extraordinary saint, written by one of his intimate disciples, His Holiness Satsvarupa dasa Goswami. The arduous sea voyage from Calcutta to Boston was finally over. The lone passenger aboard the cargo ship Jaladuta, a seventy-year-old Indian holy man, had been given free passage by the owner of the Scindia Steamship Company. His Divine Grace A. C. Bhaktivedanta Swami Prabhupada arrived at Commonwealth Pier on September 17, 1965. In 1922, Sri1a Prabhupada's spiritual master, His Divine Grace Bhaktisiddhanta Sarasvati Thakura, had requested him to spread the teachings of Lord Krsna, including the Hare Krsna mantra, to the West, and now, after a lifetime in preparation, Srila Prabhupada was ready to begin. By the summer of 1966, he had found a larger location more suited to propagating the Hare Krsna maha-mantra and the ancient science of Krsna consciousness. That summer Prabhupada had met a young man named Harvey Cohen, who offered him an old artist-in-residence loft in lower Manhattan's Bowery. Few of Srila Prabhupada's guests, whose interests included music, drugs, macrobiotics, pacifism, and spiritual meditation, knew very much about what they were chanting or exactly why they were chanting it. They just enjoyed it and liked being in the presence of the man they affectionately called "Swamiji." These musicians, artists, poets, and intellectuals, most of whom had chosen to live outside of mainstream society, felt that by chanting Hare Krsna they were taking part in something mystical and unique. Srila Prabhupada led the solo chanting: Hare Krsna, Hare Krsna, Krsna Krsna, Hare Hare/ Hare Rama, Hare Rama, Rama Rama, Hare Hare. The melody was always the same-a simple four-note phrase, the first four notes of the major scale. Prabhupada led the kirtana with small three-inch-diameter hand cymbals he had brought with him from lndia. He would ring them in a one-two-three, one-two-three fashion Some of his followers clapped along with him, and some joined in with small fingercymbals of their own. Others sat in yoga postures, hands outstretched, chanting and meditating on this novel transcendental vibration. Guests would sometimes bring other instruments, including guitars, tambouras, flutes, tambourines, and a wide variety of drums. After a few months some of Srila Prabhupada's followers secured for him a better place to live and spread the chanting of the holy name. The new Second Avenue location on the hippie-filled Lower East Side included an apartment for Srila Prabhupada one floor up and a ground-floor storefront, which he would use as a temple. Within a few weeks, the small sixty-by-twenty-five-foot storefront was packed with young people three nights a week. Gradually the storefront took on the appearance of a temple as visitors began to bring tapestries and paintings for the walls, carpets for the floors, and amplification equipment for Srila Prabhupada's lectures and kirtanas (congregational chanting). Prabhupada's kirtanas were lively and captivating, with numerous guests spontaneously rising to their feet, clapping and dancing. Srila Prabhupada, always conducting the kirtana in call-and-response fashion and playing a small African bongolike drum, would accelerate the chant faster and faster, until after about half an hour it would reach a climax and suddenly end. Chanting along with Srila Prabhupada in this small room on Second Avenue, guests found themselves transported into another dimension, a spiritual dimension, in which the anxieties and pressures of everyday life in New York City simply did not exist. Many soon caught on that chanting Hare Krsna was an intense and effective form of meditation, a direct means of communion with something greater than themselves, no matter what their conception of the Absolute. Srila Prabhupada initiated his first disciples in September of '66, at which time about a dozen students vowed to chant a minimum of sixteen rounds a day on their beads. This meant reciting the sixteen-word mantra 1,728 times a day, a meditation that would take them between one and a half to two hours to complete. The celebrated American poet Allen Ginsberg, accompanying the kirtana on his harmonium, had by now become a regular at the evening chanting sessions at the temple and in nearby Tompkins Square Park. In a 1980 interview published in Srila Prabhupada's biography, he recalled his experiences. Allen: I liked immediately the idea that Swami Bhaktivedanta had chosen the Lower East Side of New York for his practice.... I was astounded that he'd come with the chanting, because it seemed like a reinforcement from India. I had been running around singing Hare Krsna but had never understood exactly why or what it meant.... I thought it was great now that he was here to expound on the Hare Krsna mantra-that would sort of justify my singing. I knew what I was doing but I didn't have any theological background to satisfy further inquiry, and here was someone who did. So I thought that was absolutely great.... If anyone wanted to know the technical intricacies and the ultimate history, I could send them to him.... he had a personal, selfless sweetness like total devotion. And that was what always conquered me ... a kind of personal charm, coming from dedication ... I always liked to be with him. The chanting of Hare Krsna seemed to spread in an almost magical way, and as time went on, the number of people attracted to it increased geometrically. Even in this unlikely New York setting, the mantra seemed to have a life of its own. Whether it was the melody, the beat, the sound of the words, the look of the devotees, or Prabhupada's humility or serenity, nearly everyone who then came in touch with the chanting of Hare Krsna responded favorably. In December 1966, Srila Prabhupada would explain on his first record album, the LP that introduced two of the Beatles, John Lennon and George Harrison, to Hare Krsna, that "the chanting Hare Krsna, Hare Krsna, Krsna Krsna, Hare Hare/ Hare Rama, Hare Rama, Rama Rama, Hare Hare is not a material sound vibration, but comes directly from the spiritual world." Prabhupada's Tompkins Square Park kirtanas were spiritual happenings that are now legendary. Hundreds of people from all walks of life took part; some as observers and some as eager participants, chanting, clapping their hands, dancing, and playing musical instruments. Irving Halpern, one of many local musicians who regularly participated, remembers the scene. Irving: The park resounded. The musicians were very careful in listening to the mantras.... I have talked to a couple of musicians about it, and we agreed that in his head this Swami must have had hundreds and hundreds of melodies that had been brought back from the real learning from the other side of the world. So many people came there just to tune in to the musical gift, the transmission of the dharma. "Hey," they would say, "listen to this holy monk." People were really sure there were going to be unusual feats, grandstanding, flashy levitations, or whatever people expected was going to happen. But when the simplicity of what the Swami was really saying, when you began to sense it-whether you were motivated to actually make a lifetime commitment and go this way of life, or whether you merely wanted to place it in a place and give certain due respect to it-it turned you around. After the kirtanas Srila Prabhupada usually spoke for a few minutes about Krsna consciousness, inviting everyone back to the temple for a Sunday afternoon "love festival" of chanting and feasting, a weekly event that soon became a tradition that continues today. The October 9 edition of the New York Times described the Tompkins Square Park kirtana with the following headline: "SWAMI'S FLOCK CHANTS IN PARK TO FIND ECSTASY." Sitting under a tree in a Lower East Side park and occasionally dancing, fifty followers of a Hindu swami repeated a sixteen-word chant for two hours yesterday afternoon to the accompaniment of cymbals, tambourines, sticks, drums, bells, and a small reed organ.... Repetition of the chant, Swami A. C. Bhaktivedanta says, is the best way to achieve self-realization in this age of destruction. ... many in the crowd of about a hundred persons standing around the chanters found themselves swaying to or clapping hands in time to the hypnotic rythmic music. "It brings a state of ecstasy," said Allen Ginsberg the poet.... The ecstasy of the chant or mantra Hare Krishna, Hare Krishna, Krishna Krishna, Hare Hare/ Hare Rama, Hare Rama, Rama Rama, Hare Hare has replaced LSD and other drugs for many of the Swami's followers." At the same time, New York's avant-garde newspaper The East Village Other ran a front page story with a full-page photograph of Srila Prabhupada standing and speaking to a large group of people in the park. The banner headline read "SAVE EARTH NOW!!" and in large type just below the picture, the maha-mantra was printed: "HARE KRISHNA HARE KRISHNA KRISHNA KRISHNA HARE HARE HARE RAMA HARE RAMA RAMA RAMA HARE HARE." The article admired the chanting and described how Srila Prabhupada "had succeeded in convincing the world's toughest audience-Bohemians, acidheads, potheads, and hippies-that he knew the way to God." Turn Off, Sing Out, and Fall In. This new brand of holy man, with all due deference to Dr. Leary, has come forth with a brand of "Consciousness Expansion" that's sweeter than acid, cheaper than pot, and nonbustible by fuzz. I started chanting to myself, like the Swami said, when I was walking down the street-Hare Krishna, Hare Krishna, Krishna Krishna, Hare Hare/ Hare Rama, Hare Rama, Rama Rama, Hare Hare-over and over, and suddenly everything started looking so beautiful, the kids, the old men and women ... even the creeps looked beautiful ... to say nothing of the trees and flowers. There's no coming down from this. I can always do this any time, anywhere. It is always with you. Early in 1967, several of Srila Prabhupada's disciples left New York and opened a temple in the heart of San Francisco's Haight-Ashbury district, home for thousands of hippies and "flower children" from all over the country. Within a short time, Srila Prabhupada's temple there had become a spiritual haven for troubled, searching, and sometimes desperate young people. Drug overdoses were common, and hundreds of confused, dazed, and disenchanted young Americans roamed the streets. Haridasa: The hippies needed all the help they could get, and they knew it. And the Radha-Krsna temple was certainly a kind of spiritual haven. Kids sensed it. They were running, living on the streets, no place where they could go, where they could rest, where people weren't going to hurt them. I think it saved a lot of lives; there might have been a lot more casualties if it hadn't been for Hare Krsna. It was like opening a temple in a battlefield. It was the hardest place to do it, but it was the place where it was most needed. Although the Swami had no precedents for dealing with any of this, he applied the chanting with miraculous results. The chanting was wonderful. It worked. Michael Bowen, an artist and one of the leading figures of the Haight-Ashbury scene, recalled that Srila Prabhupada had "an amazing ability to get people off drugs, especially speed, heroin, burnt-out LSD cases-all of that. Harsarani: People who were plain lost or needed comforting ... sort of wandered or staggered into the temple. Some of them stayed and became devotees, and some just took prasadam [spiritual food] and left. Just from a medical standpoint, doctors didn't know what to do with people on LSD. The police and the free clinics in the area couldn't handle the overload of people taking LSD. The police saw Swamiji [Srila Prabhupada] as a certain refuge. Sunday, January 29, 1967 marked the major spiritual event of the San Francisco hippy era, and Srila Prabhupada, who was ready to go anywhere to spread Krsna consciousness, was there. The Grateful Dead, Moby Grape, Janis Joplin and Big Brother and the Holding Company, Jefferson Airplane, Quicksilver Messenger Service-all the new-wave San Francisco bands-had agreed to appear with Srila Prabhupada at the Avalon Ballroom's Mantra-Rock Dance, proceeds from which would go to the local Hare Krsna temple. At about 10:00 P.M., Srila Prabhupada and a small entourage of devotees arrived amid uproarious applause and cheering by a crowd that had waited weeks in great anticipation for this moment. Srila Prabhupada was given a seat of honor onstage and was introduced by Allen Ginsberg, who explained his own realizations about the Hare Krsna maha-mantra and how it had spread from the small storefront in New York to San Francisco. The well-known poet told the crowd that the chanting of the Hare Krsna mantra in the early morning at the Radha-Krsna temple was an important community service to those who were "coming down from LSD," because the chanting would "stabilize their consciousness on reentry." Ginsberg later recalled, "We sang Hare Krsna all evening. It was absolutely great-an open thing. It was the height of the Haight-Ashbury spiritual enthusiasm." As the tempo speeded up, the chanting and dancing became more and more intense, spurred on by a stageful of top rock musicians, who were as charmed by the magic of the maha-mantra as the amateur musicians had been at the Tompkins Square kirtanas only a few weeks before. The chant rose; it seemed to surge and swell without limit. When it seemed it could go no further, the chanting stopped. Srila Prabhupada offered prayers to his spiritual master into the microphone and ended-by saying three times, "All glories to the assembled devotees!" The Haight-Ashbury neighborhood buzzed with talk af the Mantra-Rock Dance for weeks afterward. On May 31, 1969, when the Vietnam war protest movement was reaching its climax, six devotees joined John Lennon and Yoko Ono in their Montreal hotel room to play instruments and sing on John and Yoko's famous recording "Give Peace a Chance." This song, which included the mantra, and a hit single, "The Hare Krishna Mantra," produced in September of the same year by Beatle George Harrison and featuring the devotees, introduced millions to the chanting. Even Broadway's long-running musical hit Hair included exuberant choruses of the Hare Krsna mantra. 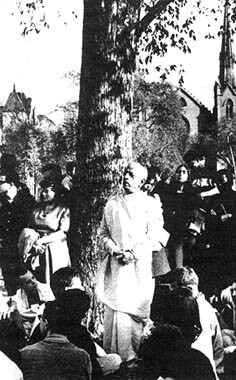 At the now historic mass antiwar demonstration in Washington, D.C., on November 15, 1969, devotees from all over the United States and Canada chanted the Hare Krsna mantra throughout the day and distributed "The Peace Formula," a small leaflet based on Srila Prabhupada's teachings from the Vedic scriptures. "The Peace Formula," which proposed a spiritual solution to the problem of war, was distributed en masse for many months and influenced thousands of lives. By 1970, when George Harrison's "My Sweet Lord"- with its beautiful recurring Iyrics of Hare Krsna and Hare Rama-was the international number-one hit song of the day, devotees in dhotis and saris, chanting the maha-mantra with musical instruments, were now a familiar sight in almost every major city throughout the world. Because of Srila Prabhupada's deep love for Lord Krsna and his own spiritual master, his amazing determination, and his sincere compassion, "Hare Krsna" had become a household word.